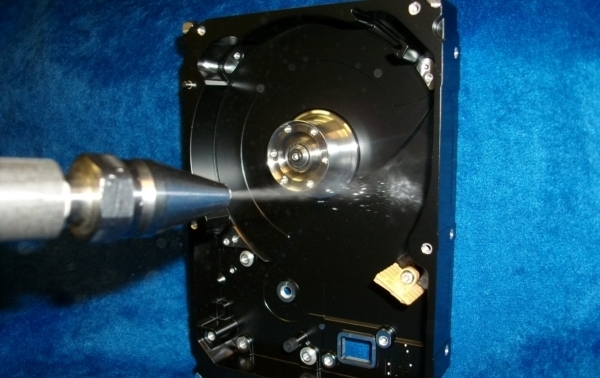 CO2 spray cleaning is a highly effective particle removal technology that is commonly used in a wide range of industries including optics, HDD, surface preparation, electronics, and many others. Key features of this effective cleaning technology include the ability to remove a wide range of particulate matter without condensation, without abrasion, without residue, and without touching. A small quantity of liquid phase CO2 is injected and mixed with a heated and pressure-regulated inert propellant gas to form a homogeneous cleaning spray mixture having both a controllable spray composition and cleaning energy. Depending upon the geometry of the mixing nozzle assembly, spray mix ratio, propellant pressure and temperature, the cleaning energy delivered to the substrate is completely adjustable. Solid CO2 particles impact the substrate at high velocities to produce a high shear stress on surface contaminants. This action creates a chemically active solid phase, providing efficient and effective removal of particulate matter, inorganic residues, and organic thin film contamination. After making contact with the contamination and the surface, the solid CO2 particles sublime, leaving no trace of this cleaning agent. The residues are removed from the cleaning zone through an integrated ventilation system. Thin organic surface layers can be effectively removed. This technology is easily adapted to manual spot cleaning, automated in-line or island cleaning systems, and in-tool cleaning applications. Cool Clean Technologies is the global leader in CO2 engineered solutions for manufacturing. Find out how to make your process Dry, Green, and Clean!